For other uses, see Rainbow Bridge. The Rainbow Bridge is a meadow where animals wait for their humans to join them, and the bridge that takes them all to Heaven, together. 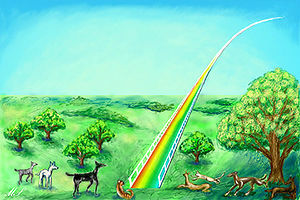 The Rainbow Bridge is the theme of several works of poetry written in the 1980s and 1990s that speak of an other-worldly place where pets go upon death, eventually to be reunited with their owners. One is a prose poem whose original creator is uncertain. The other is a six-stanza poem of rhyming pentameter couplets, created by a couple to help ease the pain of friends who lost pets. Each has gained popularity around the world among animal lovers who have lost a pet or wild animals that are cared for. The belief has many antecedents, including similarities to the Bifröst bridge of Norse mythology. The story tells of a lush green meadow just "this side of Heaven" (i.e. before one enters into it). Rainbow Bridge is the name of both the meadow and the adjoining pan-prismatic conveyance connecting it to Heaven. According to the story, when a pet dies, it goes to the meadow, restored to perfect health and free of any injuries. The pet runs and plays all day with the others; there is always fresh food and water, and the sun is always shining. However, it is said that while the pet is at peace and happy, they also miss their owner whom they left behind on Earth. When their owner dies, they too arrive at the meadow, and that is when the pet stops playing, turns, sniffs at the air and looks into the distance where they see their beloved owner. Excited, they run as fast as they can until they are one jump away from their owner's arms. The pet licks its owners in joy while the human looks into the soft eyes of their pet—who might have been absent on Earth, but never absent in their heart. Then side by side, they cross the Rainbow Bridge together into Heaven, never again to be separated. Paul C. Dahm, a grief counselor in Oregon, US, said to have written the poem in 1981 and published it in a 1998 book of the same name (1981, ISBN 0-9663022-0-6). Wallace Sife, head of the Association for Pet Loss and Bereavement, whose poem All Pets Go to Heaven appears on the association's website as well as in his book The Loss of a Pet. The genesis of the rhyming poem is straightforward: spouses Diane and Steve Bodofsky operated a ferret rescue that specialized in gravely ill animals and had many friends whose loss of pets were acutely painful; they wrote the poem for them. But when a local veterinarian asked if they could make it the basis of sympathy cards he might send to his patients, the poem gained popularity. The internet widened the restorative power of the poem internationally. The concept of a paradise where pets wait for their human owners appeared much earlier, in the little-known sequel to Beautiful Joe, the Margaret Marshall Saunders' book, Beautiful Joe's Paradise. In this green land, the animals do not simply await their owners, but also help each other learn and grow and recover from mistreatment they may have endured in life. But the animals come to this land, and continue to true heaven, not by a bridge but by balloon. The first mention of the "Rainbow Bridge" story on the internet is a post on the newsgroup rec.pets.dogs, dated 7 January 1993, quoting the poem from a 1992 (or earlier) issue of "Mid-Atlantic Great Dane Rescue League Newsletter", which in turn is stated to have quoted it from the Akita Rescue Society of America. Other posts from 1993 suggest it was already well established and being circulated on the Internet at that time, enough for the quotation of even a single line to be expected to be recognized by other newsgroup readers. ^ Rohrer, Finlo (13 January 2010). "How much can you mourn a pet?". BBC News. Retrieved 31 July 2014. ^ "Rainbow Bridge (Was: Pets passing away". Retrieved 9 September 2012. ^ "Breeder – Lifelong Responsibility". Retrieved 9 September 2012.